The endless traffic jams around the municipal government offices of Mogi das Cruzes, suburb of Sao Paulo, Brazil, had finally brought some action. Day after day, the passing commuter railroad trains had caused cars to back up at the ground level train crossing every time the train passed. To alleviate the congestion and soothe jangled nerves, the City of Mogi das Cruces government commissioned Construtora OAS Ltda, a major road building contractor, to build a road under the railroad, commencing in the fall of 1997. The complicated road building project necessitated supporting the CPTM owned Paulista Metropolitan Train lines that run between Mogi das Cruces and Sao Paulo. The subterranean railroad crossing would take months to construct and had to be done carefully in well planned stages. The contractor was charged with completing the project without interrupting train traffic. To keep the commuter trains running to and from the largest city in South America was an absolute mandate. The challenge to the contractor was to find a method that would place a support structure under the railroad tracks that would not settle and whose installation would not disrupt current rail traffic. The construction engineers decided that the only way to accomplish their task would be to create a floor or arch under the train tracks that also would also be a "ceiling" for the ensuing tunnel under them. The primary contractor brought in Novatec do Brazil Ltda, a subcontractor who would create the support structure. The engineering decision was to use a large pneumatic tool and ram in twenty-five, 32 inch (81cm) diameter steel casings under the tracks and fill them with concrete and rebar. Other methods such as auger boring, were quickly abandoned in the planning stages. Because the tunnel under the railroad tracks was only designed to be 5m high, the "ceiling" of the tunnel was to be only 1.2m from the tracks. With only this little distance to work with, the fear was that auger boring would create settling and endanger the tracks' foundation. Novatec's technical director on the pipe ramming portion of the project was Fabio Livio de Moraes. De Moraes described the decision to pipe ram the support structure. "In addition to the shallow cover problem, we had to believe that when the tracks were first built that there would be foreign material rather than clean fill used to support the tracks. With rocks, and as we found out later when we pipe rammed, old rail ties and steel rail tracks in the railbed, it would have been quite difficult if we had chosen any other method besides pipe ramming." Novatec do Brazil had been pipe ramming around the metropolitan Sao Paulo area for the past five years using their pneumatic tools in a variety of underground installations. As a proponent of trenchless no-dig applications, De Moraes sees the obvious benefits. " Its absurd," he stated. "Although trenchless methods such as pipe ramming and pipe bursting can be used in water, sewer and gas applications, many in Brazil are wedded to the old ways of raw excavation. We still have to change some minds away from tearing up public pavement as they often do in Brazil when there are less destructive trenchless methods available as an alternative. " 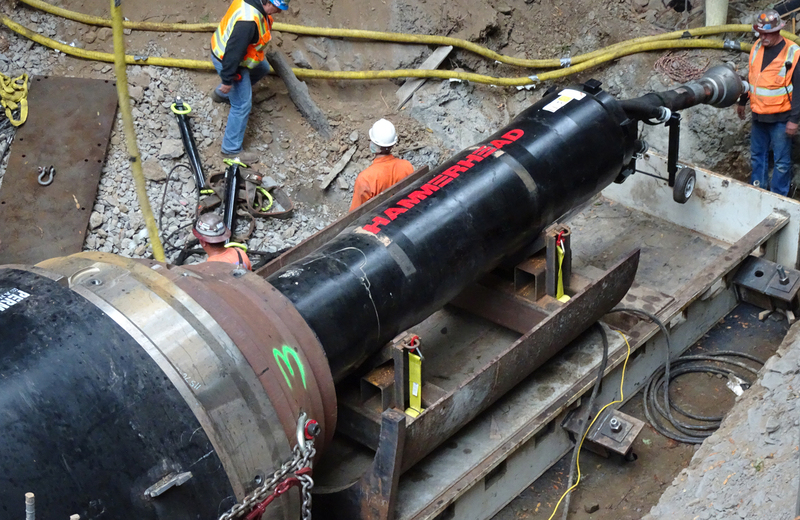 Novatec brought in the 16-inch(41cm) HammerHead Mole to pound in the half-inch(1.3cm) wall thick, twenty five steel casings that would support the railroad tracks. "The casings were 32-inches in diameter(81cm) and 40 feet(13m) long and this tool works best with this size and length of pipe in these ground conditions," explained De Moraes. All twenty-five steel casings were to be linked together when they were pounded into the ground under the tracks. They would be linked ingeniously by welding a "T" shaped angle iron onto each pipe at the side of the pipe along its entire length. On the other side of each casing directly facing the "T" of the next abutting pipe would be welded a "channel" the entire length of the casing into which the "T" of the abutting pipe would lock into as it was rammed in. This interlocking would assure that the pipes would form a continuous 22.5m(73 feet) span of support under the railroad tracks. It would also be an aid in the ramming process assuring that the pipes would enter the ground straight, on line, one right next to the other. And this method also delivered a third benefit, with the interlock providing a seal between the pipes so that dirt would not go between the pipes and reduce road bed support. The project started with the excavation of the 22.5m(73 feet) wide by 18m(60 feet) long launch pit. The pit started at the face of the railbed and projected sixty feet(18m) to accommodate the length of the pipe and the pneumatic tool. Once perfectly leveled to zero pitch, three inches(7.6cm) of concrete were poured and leveled on the entire pit to give the pipes a level grade on which to be rammed into the embankment under the rail bed. With the launch pit ready, the crew then placed a steel I-beam under the first pipe to be rammed, giving it a solid level base for it to slide on. The first pipe rammed was in the direct center of the pipe array. The plan was to start at the center and work their way to the edges of the support structure, moving the steel I-beam base to each successive pipe as they went. The preparation for each of the pipes, including the placement of the I-beam rail and the welding of the interlocking steel channels, took approximately five hours each day. Only when one pipe was completely rammed into place did the crew weld on the interlocking channel for the next pipe. Since the pipe might rotate slightly as it entered the earth below the tracks, the position of interlocking "T" and channel might shift as well. Because the length of each ram was only 40 feet (13m)and soil conditions were favorable, no lube lines were welded onto the pipe nor was a soil shoe welded onto the lead pipe as might be the case in harder ground conditions. The ramming time with the 16-inch (41cm) HammerHead Mole averaged one hour per 40 foot (13m) pipe casing. The 2,700 pound pneumatic hammer working off of 1,071 cfm of air pressure pounded each pipe at the rate of 231 heavyweight blows every minute. De Moraes was not surprised when his crew discovered all the old rail ties, steel rail and buried concrete beams under the railbed. "We expected this type of rough fill under the railbed. But using the pneumatic tool method allowed us to stop the ramming, and clean out the obstruction when we ran into these problems. Horizontal pipe ramming with large scale pneumatic hammers has been used extensively in many different underground construction applications. This specialized railroad track support was only one. Pipe ramming has successfully installed steel casing as conduit for water and sewer lines under roads, and replaced drainage culverts under roads and railroads by concentrically installing new drainage pipe over the old deteriorated line. On this application, when each steel casing was in place, a seal kit was used to close off one end of the pipe and the pneumatic hose was attached to an opening in the seal kit. Then the pneumatic pressure was employed to clean the spoil out of the pipe. With the spoil cleaned out, concrete was pumped into each of the steel casings with rebar added for structural integrity. The entire pipe ramming process for all twenty-five pipes took forty-five days and was finished fifteen days ahead of schedule. The next step to finish the structural support part of the project was to excavate approximately 1m on either end of all the pipes. Perpendicular to this and supported at either end of the 22.5m (73foot) wide span by a upside down "U" shaped concrete column, were placed two steel beams that ran under the ends of all twenty five steel casings. With the casings supported, the support was now complete and the tunneling for the road could proceed. "Pipe ramming on this job was very successful," stated De Moraes. "The HammerHead Mole worked well with this size casing and allowed us to ram through the rough fill under the railbed. When our part of the job was completed we felt as though we had been successful since we had been able to complete the support structure without interrupting any railroad traffic." Novatec has more normal uses planned for the pneumatic tool in Brazil, further expanding the use of trenchless methods in their country installing 25m (82feet) of 42-inch (106cm) stormwater drainage pipe using the 16-inch (40cm) HammerHead tool. The tunnel is now complete with 330m of new four lane roadway to move traffic conveniently under the passing commuter trains.